PPE Training: Practice Safe Work! Personal Protective equipment can include a variety of clothing and equipment that employees, students and various professionals must wear in order to protect themselves from workplace safety hazards. What Does The PPE Act Say? Firstly, an employer should ensure that the worker is not exposed to any hazards in the workplace, however when that is unavoidable, the employer must ensure that workers are provided the proper safety equipment that would protect them against any potential hazards that exist. The Codes of Practice: First Aid Facilities and Services, Workplace Amenities and Facilities, Personal Protective Clothing and Equipment 2002, all provide varies measures and suggestions in the selection and utilization of PPE. The acts also list the various PPE requirements for a multitude of workplace safety hazards. In addition to these acts, The Occupational Safety and Health Regulations 1996 provides further assistance in understanding PPE measures. Often times employees may complain due to the general discomfort and hassle associated with PPE. Furthermore, there are sometimes issues with PPE that is in poor condition or may seem inappropriate. However, the employee must be informed of the necessity of the equipment and any problems regarding inappropriate equipment must be dealt with in order to ensure safety for all. 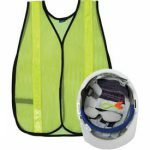 Professional guidance is requested in order to determine the most suitable types of PPE for what ever types of tasks are being conducted. PPE Training is provided to all so that they can ensure that the proper PPE is used and maintained. A constant supervisor to ensure that PPE is worn whenever required. Employees must also be informed on how to properly wear and utilize the PPE. In addition, employees must avoid the improper use or damage of the equipment. While PPE is ultimately not the most efficient way of avoiding injury, it is the last bastion of protection when all other safety measures are overcome.